Blessings, Miracles, &Thoughts in Between: Some Random Pictures! We officially have a sitter (or at least a tripoder)! Showing off her personality during tummy time today! She has major sass! 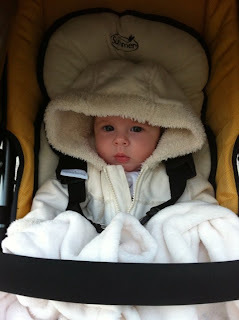 My little Eskimo baby. This is just too cute to me. She was all bundled up for our walk tonight. We've had a cold front come through and us Houstonians can't take it when the temperature drops below 60. Kate and I have a lunch date with some of our Gymboree friends tomorrow! I am looking forward to hanging out with Elizabeth and Annabel! So cute! Have fun on your lunch date! LOVE her all bundled up! Ahem..60 degrees Linds?!?! We are in capris and t-shirts in that weather! Max - it was below 60. It was like 50 on our walk. That is cold for us down here! Yay for Kate! I also LOVE that you think below 60 is cold! US TOO :) Honestly, if it drops below 70, I'm grouchy.... Hope you have a great lunch date tomorrow! Ok, Ok 50 is a bit chilly..but us NYers would LOVE us some 50 degree weather!!! She's so cute!! I know what you mean about the cold! I'm about to visit Atlanta for a few days with a high of 40s all week...BRRRR!